Alright, we’ve talked about Sidequest Decks on BoLS before. I first came across one of their decks via a Tabletop Spotlight, and was pretty immediately a fan. They add a lot of quick inspiration to your game. Whether you’re looking to add an extra wrinkle to some homebrew adventures of your own, or are wanting something to shake your PCs out of their comfort zone, Sidequest Decks have a ton of stuff. When we heard they were getting ready to launch a new batch of decks, it was pretty exciting. Especially since these three new decks live in the more unusual realms of RPG adventures. You can see there’s a lot of creativity on display here. These aren’t necessarily a substitute for a whole campaign–though as Adam Harry can attest, you could probably string a whole bunch of these together and build one on the fly. They’re a great game aid to provide inspiration. Restrictions breed creativity, and once you know–hey there are Orcs going to attack a convoy of priests with a magic item, you’re ready to take off from there. These are all system agnostic, so you can use them in whatever you want. Which makes them invaluable at my own gaming table. There’s a Kickstarter coming up later this week, but we’ve got an exclusive preview of what you can expect below. Be sure and keep an eye on Inkwell Ideas when their Kickstarter goes live. Sidequest Decks are a system agnostic tabletop RPG accessory. They are perfect for when your players unexpectedly take a casual comment for a story hook, for stocking a hex crawl or serving as the basis of a larger adventure. You may even chain several together for an entire campaign! 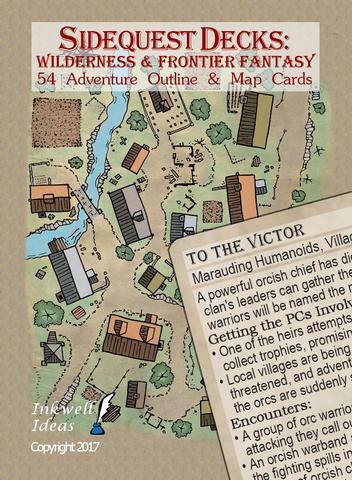 Each card has a map on one side and a mini-adventure outline on the other side. The outline starts with a short description for the GM. (Skim these to find an adventure that fits the circumstances.) Choose between a couple of story hooks to get the adventure started. Next several encounter ideas move the game along. Finally each card wraps up with one or two follow-up adventure ideas. 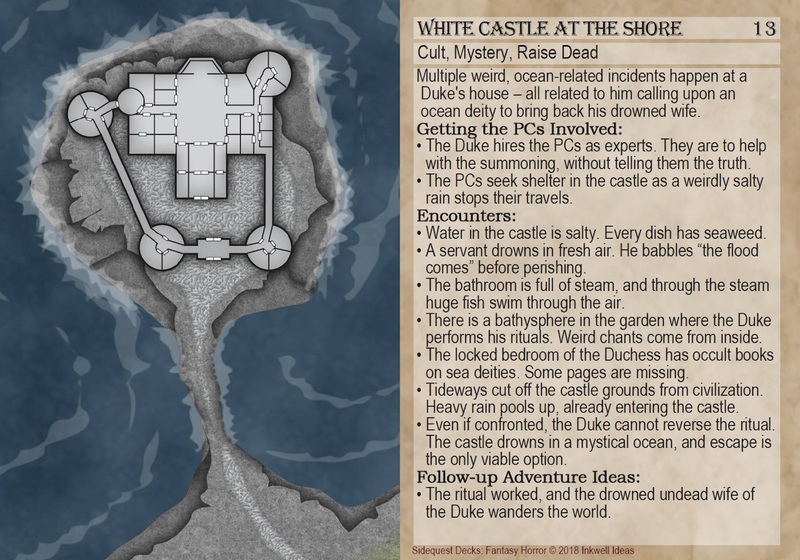 The party didn’t survive the final showdown–or worse, they didn’t even get that far. Sure you can make up new characters and the original characters’ “cousins” can show up or you can even start completely over. But thumb through these cards and you’ll find adventure ideas to keep the campaign going. For example, have the PCs fight their way out of Hell. Or perhaps they are ghost-like and can continue their quest as ghosts hoping to return to their bodies. This deck will have over 50 ideas! Whether your campaign is focused on criminals, spies, or superheroes, this deck’s adventures will have plenty of ideas you can use. Turn a spy organization into a criminal operation or vice versa to switch an adventure between those genres. Or give the foes super-powers to make the adventure fit a superhero setting. This deck will also have 50+ cards where each card is an adventure. Be sure and tune back in once their Kickstarter goes live.